I have presented various papers and lectures around the world on aspects of translation and technical communication. The following is a list of some of my presentations. 2011: Understanding the Peer Review Process. Humanities Research Institute, University of Sheffield. 2010: Scientific & Technical Translation. Guest lecture at University College London, December, 2010. 2010: Textual Cognetics: Using Psychology to Engineer Better Translations. Guest lecture at University of Salford, February, 2010. 2009: The Nuts and Bolts of Technical Translation. Guest lecture on technical translation at University College London, December, 2009. 2009: Are technical translators writing themselves out of existence? Keynote lecture at 9th Portsmouth Translation Conference, University of Portsmouth, November, 2009. 2008: The Trouble with Technical Translation. Imperial College London, 30th November, 2008. 2007: Multidimensional Challenges in Technical Translation and plenary panel discussion on translator training at Multidimensional Translation Conference, Vienna, 4th May 2007. 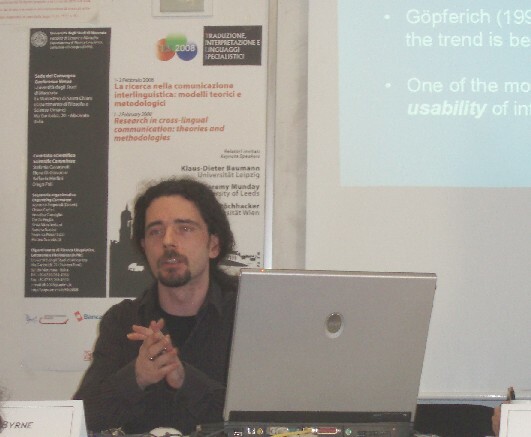 2006: Putting the Reader First: The Role of Usability in Technical Translation. Imperial College London, 30th November, 2006. 2006: Translation and the Internet: Changing the Face of an Industry. “Translation Technologies & Culture” conference, University of Portsmouth, 11th November, 2006. 2003: Translation Studies – Marketplace Opportunities and Future Trends. Seminar for language students organised by Dublin City University Careers Advisory Service. 2008: Learning Technology in the Translation Classroom. XVIII FIT World Congress 2008 in Shanghai. 2005: Suppression as a Form of Creativity in Technical Translation. 5th Portsmouth Translation Conference, University of Portsmouth, England. 2005: Leveraging TM Technology to Improve Translatability & Usability. LRC-X localisation conference, University of Limerick, Ireland. 2005: Rethinking Style in Technical Translation. 2nd DCU International Postgraduate Conference in Translation Studies, Dublin, Ireland. 2002: Freelance Translation: Teaching Students to Create Their Own Jobs. International Symposium on Specialisms & Specialisations, University of Rennes, France. 2002: Iconic Linkage & Translation Quality. Research Showcase, Dublin City University.